Absolutely perfect under my table! Everyone always ask where I get such perfect things..love telling them what amazing choices and deals that I get when I order from Overstock! 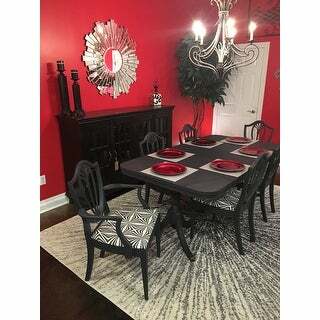 I actually took the inspiration from the rug and recovered my chairs and painted the table. Absolutely love the results! 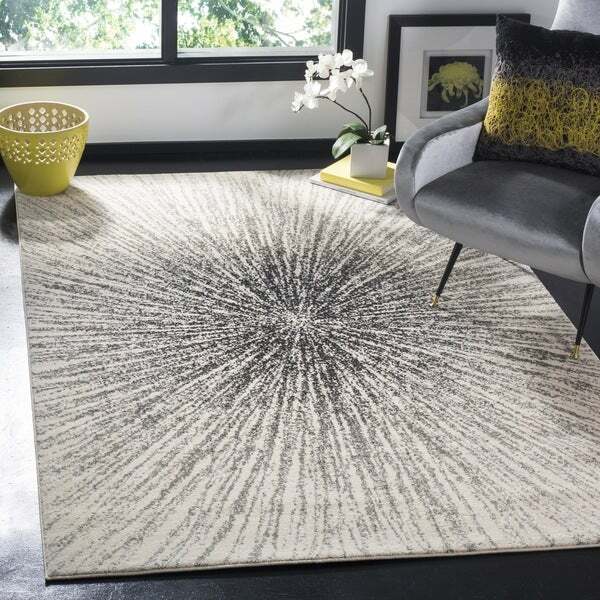 Safavieh Evoke Nova Abstract Burst Black/ Ivory Rug - 5'1" x 7'6"
Safavieh's Evoke collection is inspired by timeless vintage designs crafted with the softest polypropylene available. 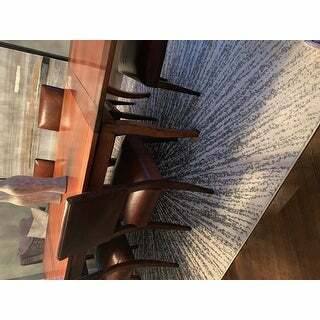 This rug is crafted using a powerloomed construction with a polypropylene pile and features main accent color of black. Kaboom! That’s what this well made rug does to my dining room. This is a beautiful rug. Looks more prettier than pic. Its size is 8 X 9.9. Its 3 inch smaller than mentioned dimension in the description. Its not pile rug. 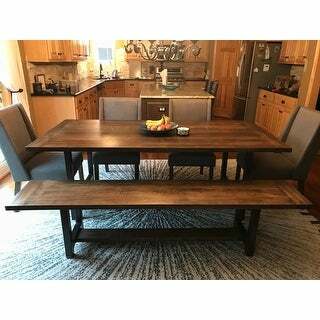 Its good for Dinning room. Looks amazing. Great, modern rug for the price! We have it in our family room and it looks great. The rug itself is not white/white. It is slightly off white with the color burst ranging in color from black to grey. This rug makes a statement without being over the top. We are happy with the purchase. This is my second Safavieh rug and it is wonderful. It matches the living room rug (also Safavieh) perfectly. The colors are true to the pictures and the quality is great. Vacuum both rugs when I received them and absolutely picked up nothing. No little rug pieces. The rug was received in 7 days and wrapped well. Differently will shop for more. We were nervous to buy this rug, as we've never really had a statement rug design like this before. But it looks great! It pulls a lot of the black and cream from our other furniture together and brightens up our room, which has darker hard wood floors. If we had to do this again, we'd purchase the same rug. This is not black and white, but rather shades of grey and black with light cream. 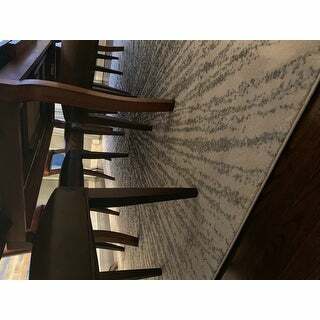 Beautiful rug, I am very pleased with the quality and the style. It really makes an impactful statement in my room and would be a great addition to any room. Neutral in color but not boring by any means. Love it. Once I saw this rug I instantly fell in love. Statement rug for any room. The only thing I wish was different would be the softness of the rug. I pictured it being much softer to the touch. But by adding a thick rug pad it would at least give the rug a little more plushness when stepped on. This rug is exactly what I wanted for my study - a room with dark blue walls and masculine leather furniture. It has a brass light fixture that is a sunburst, which hangs over the desk. This rug goes with my mid-century modern house perfectly, and I got it to also mask dog hair - I have a large black and a large white dog, and the pattern goes from black to gray to white, so it hides all of that shedding. We just moved and our home by structure is more homey and traditional. My style is more modern farmhouse. This rug blew me away. It’s so soft and thick. It ties our dark counter tops and cream walls perfectly. The colors are true to the picture. This was my first purchase with Overstock and it won’t be my last. Rolled out the rug and put some items on the corners so it would flatten out, and it is laying perfectly after a few hours. 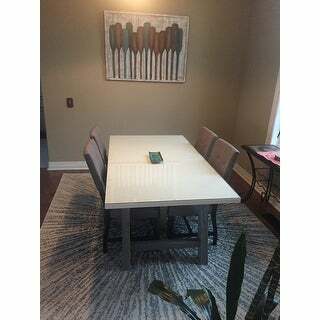 Nice quality for the price, and adds complements the room nicely. 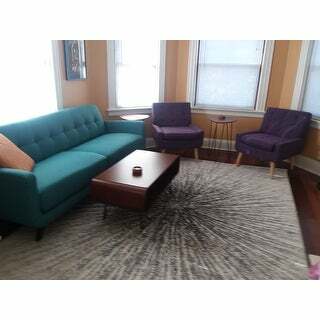 I have the same rug in blue in my office....liked it enough to buy it twice :). Delivery was speedy—had it in less than a week. This rug is fab! It looks better than the pictures. It goes perfectly with mid-century modern furniture. It is easy to care for. It also goes with any color scheme. We love this rug in our family room. The quality is great and does not shed or pull easily. Definitely reccomend this rug! This is a very pretty rug, eye catching. I wish it were a little less black and more grey, but its fun. A very bold statement. Exactly what I was expecting. Perfect thickness for an office chair to roll around on. My only disappointment was that the binding threads were cut in one very conspicuous 1/2 inch spot on one side. The carpet looks great in the bedroom. It is not very thick but looks exactly like the pictures. "This is exactly what I want in either cream or brown, does it come in brown tones?" This rug is beautiful....it's ivory, gray with a burst of black. There is no brown in it. "What is a true size of this rug? Some comments specify a smaller or a size discrepancy. Please let me know before I will place an order. I would like a 6'7" x 9, but some describe it as smaller size delivered. Is 8 x 10 a true size or it will run smaller?" The design is simple yet dramatic. I hope the 8 X 10 is a Safavieh as I bought the round Safavieh rug, also, and hope that they match. "Does this rug come in a larger size 9 x 12?" This item is not currently available in a 9x12 dimension. "its not possible to see what this rug actually looks like. Is the design coming directly from the center to the outsides of the rug??? is the design repeated throughout the rug??" Hello laureni, the design is coming from the center and extends to the ends of the rug. This is a single design and is not repeated more than once. Have a great day! Safavieh SoHo Hand-Woven Wool Dark Grey / Silver Area Rug - 7'6" x 9'6"